Blue Roofs: The Newest Innovation in Green Building? If you’re hip to the newest features in green building, you’ve probably heard about green roofs. Covered in living vegetation, these surfaces not only look cool and otherworldly—they also have a bunch of energy-efficiency benefits as well. The moss planted on them packs a double punch of environmental impact: it cools and shades interiors in the summer, and insulates and protects them from the elements in the winter. However, one of the lesser-known benefits comes in the form of managing storm runoff toxicity. Green roof surfaces filter out pollutants before they can reach at-risk water sources beyond the home. And that brings us to the blue roof. Blue roofs may not be covered in moss, but they do share the same goal of mitigating storm water runoff. They do it by allowing water to pool or “pond” on roofs, storing the runoff in a separate area until it can be processed by local sewage treatment facilities. Read on for the full scoop on blue roofs, what they do, their impact on nearby ecology, and some of their pros and cons. Why Install a Blue Roof? How Is a Blue Roof Designed? What Other Benefits Come with Blue Roofs? To understand why builders have taken to installing blue roofs, you need to know a little bit about how storm water runoff is processed by cities. Urban areas currently manage runoff through ground sources, like ponds and drainage systems. These drainage systems carry runoff to sewers, so they can be treated and processed along with other wastewater. What frequently happens, however, is that during an unusually intense storm, these systems will become overloaded. At that point, rainwater and untreated sewage—known as combined sewage overflow or CSO—may flow out into nearby streams and water sources. In fact, in some areas it only takes about half an inch of rain to see these results. Raw sewage contamination can severely damage fragile ecosystems like these, killing fish and poisoning marshlands and streams. 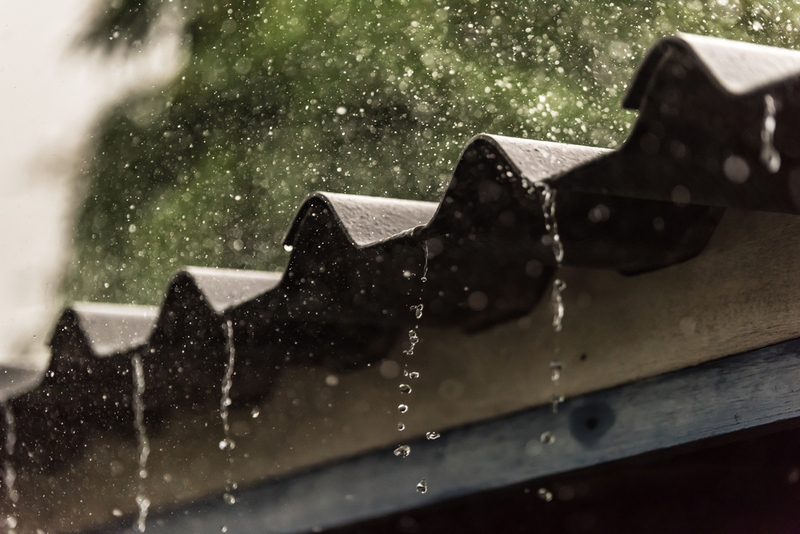 However, in built-up urban areas, much of this rainfall hits roof surfaces first, before being funneled by gutters and drainage systems onto the ground. So what if homes were designed to help manage rainwater runoff by storing excess water that falls on the roof? Enter the blue roof. First off all, we should clarify one thing: blue roofs aren’t actually blue. The name comes from the idea that they help with water processing, not their actual physical hue. As a fairly new innovation, builders are still testing the waters with blue roof design. A pilot program in New York City uses a specially designed “blue roof tray” system, however. On these surfaces, risers installed on roofs collect and pond water near a drainage outlet. Builders further equipped these roofs with miniature dams to store water, or trays that can hold up to two inches of water. After testing both methods, the trays seemed to be the most effective, since they were separate from the roofing membranes, meaning these areas were protected. Initial results from this program showed it resulted in a 45 percent reduction in rainwater runoff, a fairly significant amount. Blue roofs can be paired with other innovative roofing technologies to increase their environmental impact. For instance, New York City recommends installing blue roofs with light colored materials to cut back on heat gain in building interiors. In other cases, they may be combined with the aforementioned green roofs for some energy savings and air quality benefits, as well. Most of the time, if you had two inches of water on your roof, you’d have a big problem. There’s a reason roofers tell you that ponding water is indicator for roofing repairs—it can cause some real damage to your roof, in ordinary circumstances. Blue roofs are obviously designed to manage and hold that water, so there’s less fear of degrading the surface with excess moisture. But many roofers remain skeptical of blue roof technology. They argue that it’s dangerous to add a heavy load like that to your roof, because it could hasten a total collapse. And, if your roof was to collapse with several inches of rainwater on it, the damage to your interiors would be much more significant. Roofers who oppose blue roofs also say that there’s no need to play with fire this way, especially when there’s a much better (and easier!) option available now. They say funneling water into a rainwater harvesting system makes for a safer and more efficient use of this excess runoff. However, if you’ve read all of that and still want to try a cool roof for your home, you’ll probably have to wait for a while. Since this technology is still in its infancy, it’s not exactly permitted in any areas except those with pilot programs. That being said, considering the success that the NYC roofs saw, you may be able to have one on your home sooner, rather than later!